Thousands of Taiwanese protesters, taking a page from France‘s yellow vest movement, marched on Thursday for the third time this month, demanding lower taxes and the fair handling of tax disputes. 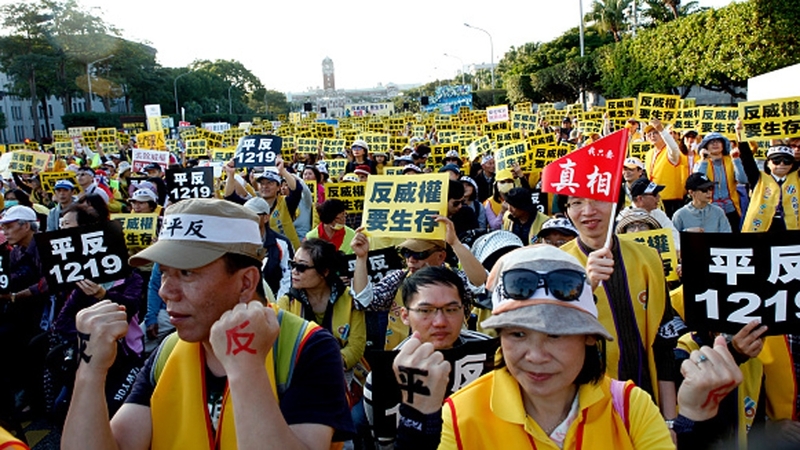 Wearing yellow vests, the demonstrators shouted slogans and blared air horns outside the Ministry of Finance in the island’s capital Taipei, and waved banners calling Taiwan’s tax collection policies illegal. “This is about our futures,” said Joanna Tai, a 23-year-old English-language graduate student who plans to teach after graduation next year. “We look at wages in Hong Kong and mainland China. We want to know why there’s so much of a gap with Taiwan,” she said. The Tax and Legal Reform League, an activist group founded in 2016, called the protest after marshalling about 20,000 people outside the presidential office in an initial demonstration a week ago, and another 10,000 on Saturday, according to organisers and local media. Organisers said they were inspired by the success of the recent French protests, which were sparked by tax increases on petrol and diesel. The protests, which led to rioting in the French capital, Paris, forced the country’s President Emmanuel Macron to scrap the planned fuel tax rise, and announce a series of other concessions, including increasing the minimum wage for full-time workers. “We saw Macron and he wanted to soften up, so that gave us some encouragement to protest, so we hope the president here can hear our voice,” said Wang Chih-lan, the media liaison for the Reform League. Protesters said they had received tax bills sent in error or asking for too much tax. An appeal costs too much, they said, and tax collectors sometimes keep hounding them for taxes even after losing in court. Income taxes add hardship to young people in low-paid, entry-level jobs, some said. Speaking to the crowd, Tze-lung, a retired law professor and protest organiser, said reform was needed for a more equitable and transparent system. Janey Lee, a volunteer for the Reform League, said appeal fees can be a “huge emotional burden”, and called for transparent handling of taxpayers’ money to attract more foreign investment. The average monthly wage in Taiwan is $1,364, and the minimum wage is set to rise to $750 in January. Earlier this week, a spokesperson for the Finance Ministry said anti-tax activists have been pushing for lower taxes for about 20 years. Tsai Meng-chu said that the ministry has responded to some of their complaints on its website, including a rebuttal to allegations that the tax system contributes to poverty. “Their complaints are just that they’re not satisfied with the tax system,” she said, noting that Taiwan offers payment deferrals to low-income individuals. During her campaign, President Tsai Ing-wen said she would work on wages and welfare for youth. Taiwanese who earn less than 2.42 million new Taiwan dollars (about $78,500) a year pay no more than 20 percent in taxes, according to data compiled by professional services firm KPMG. The yellow vest movement has then spread to several countries including Belgium, the Netherlands, Egypt, Spain, Lebanon and Israel.